February might have been the most exhausting month that I can remember. The team at Creative Mornings Vienna asked me to give a talk about Moments and my plan was to launch my Kickstarter at the end of the talk. 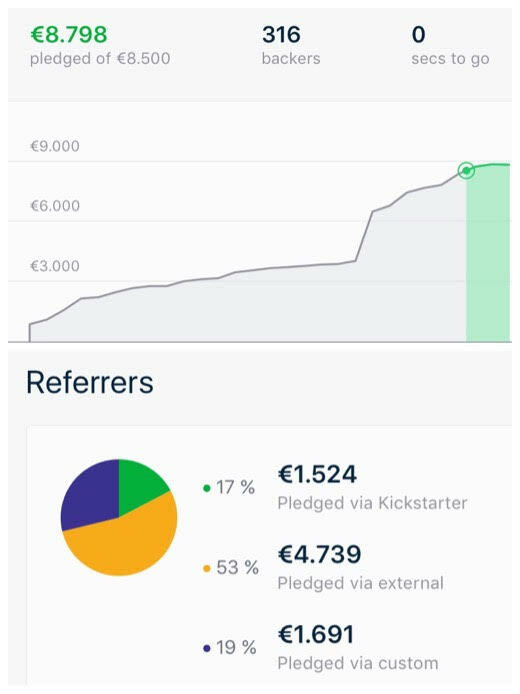 Due to a major bug, the Kickstarter project couldn’t go live, which completely changed how I felt about my performance in general. Creative Mornings is one of my most favorite communities and thus, it was a big deal for me to get such a unique opportunity, but the ending of the talk made the entire strength of it fizzle out. It left quite a bitter aftertaste. Nevermind. You win some, you lose some I guess. I then launched the project on a Friday afternoon, the one time of the week when you’re not supposed to launch a project on Kickstarter. My plan was to do a secret launch for my previous backers and then launch publicly the following Monday. For the ones who followed the project, you might have noticed that we were stuck at 48%. I temporarily sort of lost hope and needed to somehow rebuild it. That’s when I announced, what I called, the plan B. I offered to help people set up their websites. This kicked in and it brought the campaign from 48% to 73% within 24 hours. We were on our way! When you launch a Kickstarter project, you never know what’s going to happen. You have to be prepared to roll with it and if plan A doesn’t work, you need to come up with a plan B, C, or D. Because something that might have worked last year might not work this year. You have to be open to trying things out. It’s exhausting, your adrenaline is probably higher than it’s ever been, which then leads to many sleepless nights, but once the project is over and is one of the 36% successful projects, you’ll be extraordinarily proud you’ve pulled it off! In February, I spoke about Remote Work at the Factory in Berlin and helped host a Berlinale side event there too. I also hosted a fashion event at Denim City in Amsterdam and a journalist dinner at Balthazars Keuken with such amazing people, such as Angel Trinidad and Margot van der Krogt. One of my highlights has been a workshop about community building for Oikocredit. In a group of 20 participants, we discussed the differences between “old school advertising” and engaging community building. It’s still important to tell people that having a community has nothing to do with having a Facebook page or being on Twitter. Community is about engaging people in a conversation and giving them opportunities to help shape a brand!